Odyssey announces Exciting new additions to Odyssey's Flight Ready® "E" Series cases. 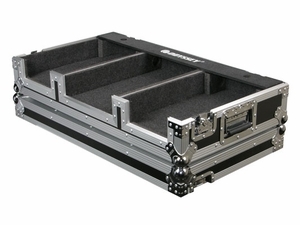 First introduced at the beginning of this year, this popular family of standard-duty flight cases now includes a new Turntable case and six Pioneer gear specific cases. Each case is made of black wood laminate construction with all chrome plated steel hardware. The FZ10Pi400WE is made specially for the popular Pioneer 400 series CD player. Our Flight Ready® brand specific CD DJ console holds one 10” and two CDJ-400s. Features include recessed hardware, slide-out panels for CD entry, and recessed wheels for easy transportation.